A chance to network, pick up new ideas and improve their communication skills. The young researchers invited to the 2017 Marcus Wallenberg event in Stockholm were pleased with the experience. A workshop with three-minute presentations, 3MT, was one of the highlights during the Young Researchers’ Program to celebrate the 2017 Marcus Wallenberg Prize in Stockholm, Sweden, last October. Please apply online to this year’s Young Researchers’ Challenge. All 36 participants had three minutes each on stage, where they communicated their own research showing only a single slide. 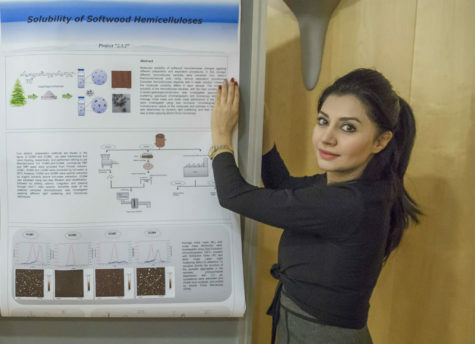 Saina Kishani, Wallenberg Wood Science Center KTH, showing her poster about water solubility of softwood hemicelluloses. Saina Kishani Farahani, PhD student at Wallenberg Wood Science Center, KTH, enjoyed the challenge. – It was a fantastic opportunity to empower my presentation skills, she says. Listening to other scientists gave her new insights. Above all she was very impressed by the research on gene modification. – Since I’m working with hemicelluloses I think gene modification could open a new path for improving the properties of these biopolymers. The presentation on forest-based foams also gave me the idea to use my extracted hemicelluloses for making foams, Saina Kishani Farahani says. The Young Researchers’ Program also gave her a chance to talk to colleagues in the same field from different parts of the world. – I met some seniors working on similar projects as mine, which could open the door for future collaborations, she hopes. Aura Salmivaara, research scientist at Luke, Natural Resources Institute Finland, also appreciated the networking. 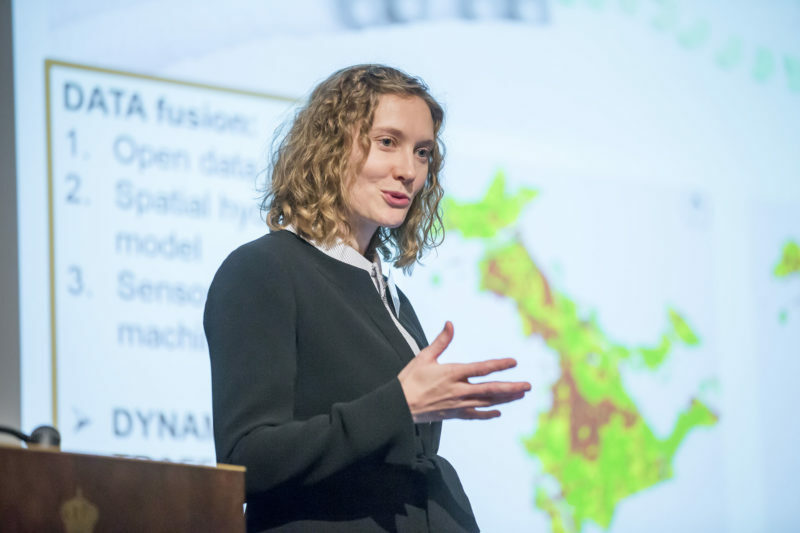 – The event provided plenty of situations where I could get to know fellow researchers and widen my perceptions on the latest research going on in the forestry and wood technology sector, she says. Attending the award gala and banquet was to her “the cherry on the cake”. – It provided possibilities to have discussions with very influential people, Aura Salmivaara says. Lilian Matallana, post doctor at North Carolina State University, USA, also looks back at the prize ceremony and dinner with great pleasure. 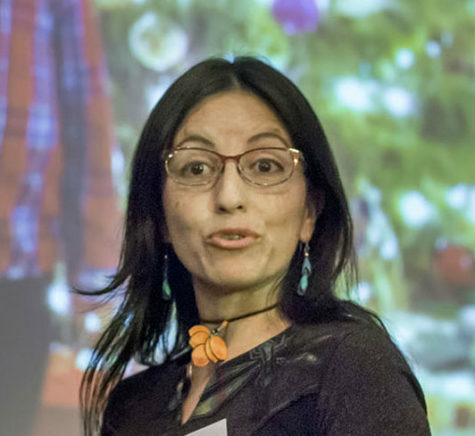 Lilian Matallana, post doctor at North Carolina State University, USA, enjoyed taking part of the workshop with three-minute presentations. – I never thought an event linked to science would be the reason to dress so elegant for the first time in my entire life. During the evening I met very interesting people and possible future collaborators while I was having a bite of the Swedish culture. Without a doubt the event was a once in a lifetime event, Lilian Matallana says. The Marcus Wallenberg Prize Selection Committee had invited post doctors and PhD students from different universities and research institutes in Canada, Finland, Sweden and USA to a four day stay during the prize event. The young researchers took part of lectures and guided visits to the Vasa Museum, Stora Enso Biomaterials Innovation Center and Wallenberg Wood Science Center Academy at KTH Royal Institute of Technology and Cellutech AB – all in Stockholm. 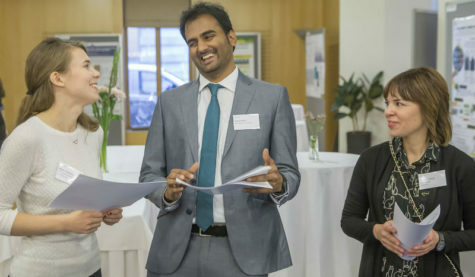 Minna Hakalahti, VTT Technical Research Center of Finland, is networking with Vinay Kumar, Åbo Akademi University, and Ainhoa Calleja-Rodrigueez, Skogforsk.